Awww! Poor baby! That foot itchies stuff can't be fun, but what a trooper she is! 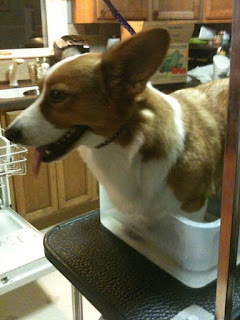 She sure is being a good girl just standing in the solution. Wilson got a mild yeast infection once when he had to keep his foot bandaged for a bit. The vet gave us some sort of powder to sprinkle between his toes, no soaking in a pan thank goodness!